You spend hours each week scanning through your Facebook news feed, scrolling past pics on Instagram, and checking to see who was clicking on your LinkedIn profile. You have push notifications on your phone, email notifications hitting your inbox, and reminders popping up in your browser so you don’t miss a conversation. I hate to break it to you, but you are missing some messages. Some social networks have installed secret inboxes that you don’t know about. Who has them and how do you get to them? I’ll show you. Start by going to the Facebook News Feed and clicking the Messages feature on the top left menu to access Facebook Messenger. You’ll see your current inbox from Facebook Messenger, but have you ever clicked the Message Requests option on the top? This is the first secret inbox and these messages are from people Facebook thinks you might know. I’ve had some legitimate message requests sent here from people I’ve actually met, and I’m glad I checked them! Click the More dropdown menu on the right, and you’ll see even more inboxes for unread, filtered, and archived messages. The filtered messages – Facebook’s second secret inbox – are from people you’re not Facebook friends with and they’re placed in a secret inbox because Facebook thinks that the sender may be trying to send you spam. Judging by the images I’ve seen here, Facebook is right. You may know about Instagram’s direct messaging inbox that allows you to send messages and photos to other Instagram users you’re connected to. Within the last few months, Instagram snuck in a little update to this inbox called Message Requests that allows people you aren’t connected to on Instagram to send you messages as well. To find your Message Requests, start by opening up Instagram and going to the News Feed. Click on the inbox on the top right of the screen. You’ll see any previous messages listed here in your regular inbox, but if you see a blue strip at the top that has a number and the words Message Requests, then you’ve got messages in this secret inbox. If the blue strip doesn’t appear, then you don’t have any messages waiting for you here. Click on the Message Requests notification to get to the messages. Click on them to read them. You can click the Allow button to let the sender know you’ve seen the message and write a response. When you allow a message, future messages from that sender will appear in your direct inbox. If you click the Decline button, you can ignore the message. LinkedIn has two kinds of secret inboxes: one is in your regular inbox and the other can be found in your connection requests. They contain communications from blocked users that I’m assuming – I couldn’t find details on this – that LinkedIn believes are people you may not know and are trying to spam your profile. To find your secret message inbox on LinkedIn, start by clicking the messages feature on the top menu bar. Then, click the All Messages dropdown menu near the top of the page and select the blocked messages. At some point, LinkedIn started filtering your connection requests and they’ve hidden them in a secret inbox. It’s definitely important to check these because I’ve found some legitimate requests there from people I actually know. Don’t leave them hanging! You can find these hidden requests by going to LinkedIn and clicking on the invitations feature on the top menu. LinkedIn will show you your pending invitations and a list of people you may know. Click on the dropdown menu on the right of the pending invitations and select Blocked invitations. The list of LinkedIn users whose invitations are blocked will appear on a new screen. Now that you know about the secret inboxes on Facebook, Instagram, and LinkedIn, I hope you check them out and I hope you find something interesting there! It’s not always spam. Don’t ignore these messages. They might be from actual people you know that have been waiting to hear from you. What do you do when you want to search for something online? You probably open up Google in your Internet browser and type in your search, right? But what if you’re in the middle of using a social network? You’d have to leave the webpage on your desktop or app on your smartphone and start your search on Google. Social networks don’t want you to leave, so they’ve built in some helpful search tools you may not know about. In case you haven’t been using them, here are a few tips on using three social networks – Facebook, Pinterest, and Instagram – to conduct a search. Facebook introduced its Graph Search tool (the search bar at the top of Facebook’s desktop page or smartphone app) in 2013. It pulls information from Facebook’s big data resources – as well as your relationships, activity, and pages you like – to help you find people, pages, posts and other options based on your search query. To be honest, it’s not the easiest search tool, but once you start trying some searches, you’ll learn what types of queries Graph Search responds to in order to produce the best results. 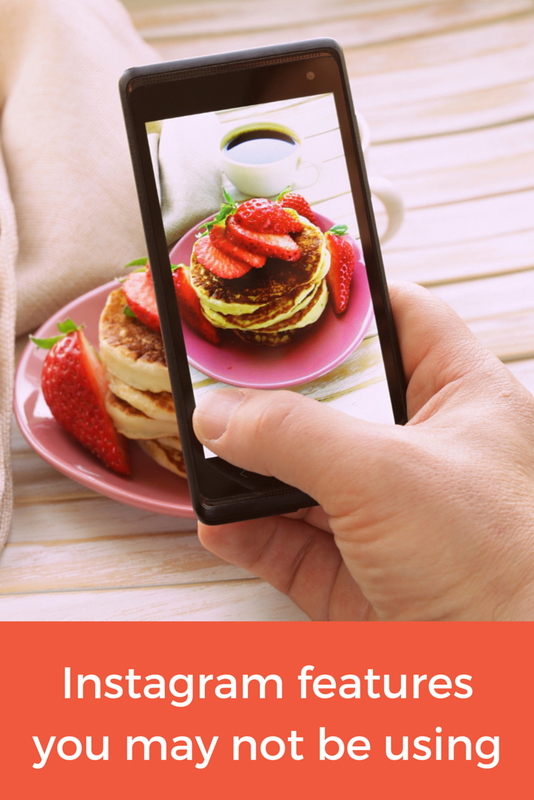 Pinterest has text search tools like other networks, but what makes Pinterest really stand out with search is its visual search tool that finds other pins that share the same image. The visual search tool is available on any pin. Get started by clicking on a pin that has something in the image you’d like to search for to see Pinterest pins containing similar items. When you find a pin you like, click on it to enhance its size, and then access the visual search tool by clicking the magnifying glass in the top right of a pin. The search tool opens a search box that you can resize over the pin to focus on a specific item in an image, or you can resize it over the entire pin. Once you’ve set the search box size, Pinterest visual search will show you pins that match your image. If you see an icon next to the word from and a business name under the images in pins that show up in the search results, these are product pins, which means it’s easy for you to buy the product pictured in this pin. Product pins are linked to retailers’ websites – the retailers add code on their site that connects their web content to their Pinterest profile and content – which means that you can click on the pin and go directly to the retailer’s website to purchase the product. Because of the location tags you can add to Instagram posts, Instagram has become a great way to find out what’s going on at locations near you. Start by going to the search bar in Instagram and clicking the Places tab. Instagram will offer a search for places near your current location, as well as suggested cities nearby. 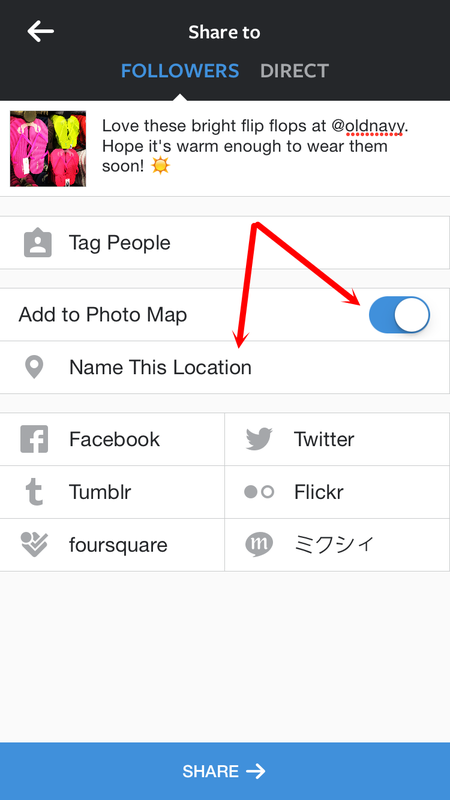 Click the Near Current Location to find locations that have been recently tagged in Instagram posts. Choose one of the locations in the list. 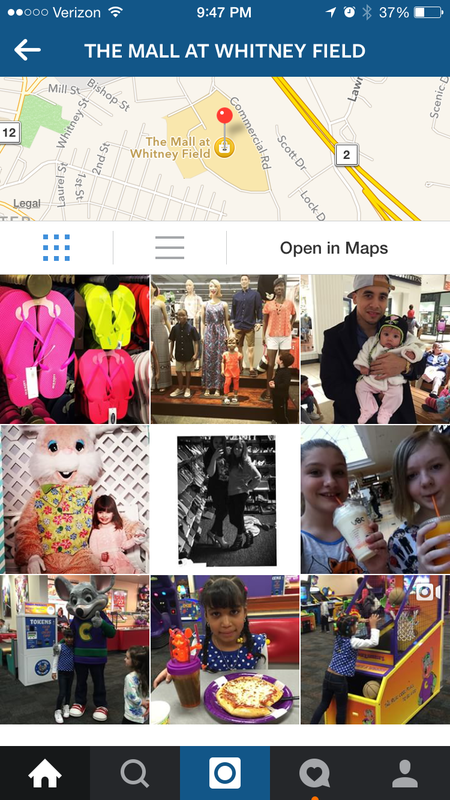 Instagram will show you a map of that location, a list of the top 9 posts from that location (posts that have gotten the most engagement – likes, comments, and shares), and a reverse chronological list of the most recent images that have been tagged with the location. Why would you want to use this? You could be visiting a new city and looking for something to do. You could be bored and want to find out if there’s anything worth checking out in your area. Or you could have plans to attend a place or event, and you can check out the recent images from the location to see if it’s worth checking out. What are your favorite search tips? These are the social media search tips I use the most, but there are tons of ways to search using social networks. What are your favorites? Did I miss some big ones? Let me know in the comments. Ah Facebook. We love it, but there’s a few things that baffle us when we’re posting to and scrolling through its news feed. Luckily, there are a few fixes to these common issues and I’m happy to share what I’ve learned to make your Facebook activity a more pleasant experience. 1. Facebook doesn’t show me posts from my favorite businesses. You might not be aware that Facebook doesn’t show you every single post from every friend and business page you like. Which is a good thing! The average Facebook user has 338 friends and likes 70 Facebook business pages. Can you imagine scrolling through every little thought that is posted by your community all the time? Facebook tries to give you an experience that’s more tailored to who you’re actually interacting with by using an algorithm to curate content that you might like. So, if you haven’t been interacting with your favorite businesses because their posts aren’t popular enough or because maybe they haven’t been actively posting, you may be missing out on posts that you actually want to see. How many restaurant specials, retail sales, or local events have you heard about after they’ve already happened? Chances are these pages have been sharing this information on Facebook, but the news feed algorithm doesn’t show them to your feed. First, go to the Facebook page of a business, and hover over the Like button that appears over the cover photo. You’ll see a few choices: See First, Default and Unfollow. See First shares the page’s post first at the top of the feed. Default means that the posts will be sorted and posted according to Facebook’s algorithm. Click See First to see this page’s posts at the top of the feed. The second option is to create an Interests list for pages you don’t want to miss. Start by clicking The Interests category on the left side of your Facebook news feed menu. Then, create an Interests lists by clicking the +Add Interests button. Next, click the +Create List button, and Facebook will bring up a window with a list of all of the pages you follow. Select the ones you want in your list, name your list, chose its visibility (public, your friends, or only you), and click Done to save. I created a list for local restaurants in my area, and now I can check for recent posts from those restaurants so I never miss a special deal or new menu item. Issue 2: Facebook shows me ads that don’t fit my preferences. Sometimes you’ll see a sponsored post in your feed and wonder why it’s there because it’s about something you’re not interested in at all. Clean up the ads in your feed by clicking the dropdown menu in the right corner of the ad and click the Hide ad option. You can make Facebook show ads that are more tailored to your interests by clicking the Why am I seeing this? option. Facebook will share why you’re seeing the ad based on the interests that were selected by the page that placed the ad. Facebook assigns these preferences to you based on not only what types of pages you like, but what ads you’ve clicked on in the past, and content you’ve clicked on on and off Facebook. If Facebook has chosen ad preferences that don’t match what you like, click the Manage Your Ad Preferences, and then hit the X button to delete preferences you don’t want. Issue 3: Facebook includes the wrong photo when I’m sharing a link. Sometimes if you’re sharing a link to a webpage that has several images, Facebook will upload one with your post that’s not relevant. This happens a lot when sharing links to news sites, which means a photo of a car crash could appear next to a link you’re posting about a viral cat video. You do not want to illustrate a happy story with a tragic image! If you see a set of arrows in the top left corner of the image that appears above your link, that means Facebook has found multiple images on the page you’re linking to. Simply tab through until you find the one that fits your post. Issue 4: The link I’m sharing on Facebook doesn’t display an image in the post. I don’t know enough about code to know why Facebook sometimes doesn’t pull in an image from a link you’re sharing in a post, but you do need a photo to draw peoples’ eyes to your post. There is something you can do to fix this, but you need to start over with your Facebook post. Instead of placing the link first in your status updates, start your post by uploading a photo first. You can right click on an image from the webpage you’re trying to share and save it to your desktop or take a screenshot and save it to your desktop. Then upload that photo to your status update and add the link in the text box. The post won’t automatically populate with the headline and description of the page, so you’ll have to remember to include that relevant information in your post. Issue 5: Facebook is showing me On This Day reminders for people I’d rather not see. Unfortunate things happen to the people in our lives – deaths, breakups, or friendships that end badly. Facebook’s On This Day app doesn’t know this, so these people or moments who remind us of heartbreak will sometimes appear in the posts from the past that it suggests each day. And if you start your day by scrolling through Facebook, you don’t want it to begin with these reminders. You can, however, tell the On This Day app to stop showing you posts that involve the people you don’t want to be reminded of. Start by going to the Apps section in the left side of your Facebook menu, and choose the On This Day app. Then click the Preferences button. From there, you can tell the app to avoid reminding you of certain people and dates. One note about the people filter: it can only block people who you are friends with or who allow you to see that they have a Facebook profile. If someone has blocked you from seeing they exist on Facebook, you can’t select them for the filter. These are 5 common issues I’ve been experiencing when posting to Facebook, and if any of these are yours, I hope I’ve helped you make your Facebook news feed a happier place. If you have more annoying things Facebook does, let me know in the comments. If you don’t know how to fix them, let me know and I’ll find a solution for you! The holidays are coming up, and naturally shoppers are eager to find ways to save a few bucks while searching for gifts and the necessities for entertaining. Look no further than Target. You may have to do a little work on your end, but trust me it’s worth it. All you need is your phone, an app, and text messages. Let’s start with Cartwheel, the little app you won’t be able to live without. Cartwheel is Target’s in-store coupon app, and it’s available in the iTunes store and Google Play. Cartwheel allows users to store a limited amount of coupons on the app. There’s a gamification element to the app: as you spend more and complete tasks, you earn more coupon spots. Start by downloading the app, and then setting up your account through your Target login, Facebook profile or Google account. As a new user, you’ll have 10 coupon spots. Coupons can be reused multiple times until they expire. Manually through the Offers tab. Once you click on offers, you can search by category and see available offers. Using the search feature (click on the magnifying glass) and type in your search terms. Using the Scan Product tool. This is best part of Cartwheel. Scan barcodes on items in the store, and Cartwheel will tell you if there is an offer for the item, or a suggested offer if your particular item doesn’t have a discount. Using collections. Collections are offers arranged by certain themes, like seasons, holidays, best sellers, or from Target’s weekly ad. Following social activity. Target has a news feed of recent activity from the Facebook friends you connect with, and you can add offers to your account from the feed. If you’re a regular Target shopper like I am, 10 coupons is simply not enough to supplement your twice a week (or more!) Target runs. How do you get additional coupons? That’s where gamification kicks in. Cartwheel gives users badges for accomplishing different tasks like connecting with a Facebook friend through the app, adding an offer from one of the collections, redeeming an offer multiple times, and saving set amounts of money with the app. The app can sometimes be buggy because of weak wifi signals in the store. Make sure you’re using Target’s in-store wifi. Sometimes shutting off the app, and restarting your phone will help reset it. If this happens a lot, you may want to add your offers manually before stepping in the store. Offers last for different amounts of time, so check your Cartwheel app for expired offers and new offers every time you go to Target. Cartwheel has a special promotion for featured toys during the holiday season. There’s a different featured toy each day from now through Christmas Eve. Check the Hot Gifts for Cool Kids collection to add offers to your coupons. Sometimes the offers are not listed in the right category. I recently found an offer for Keurig Green Mountain coffee in breakfast and not beverages, so you might want to look in multiple categories, use the search feature or scan the item’s bar code just to be sure. Don’t want to pick up an item to scan it? You can scan the barcode for items on Target’s shelves. It’s the same code that’s on the item itself. Tell your cashier you’re using Cartwheel. Target cashiers have to apply Cartwheel and other offers in a certain order, so let them know in advance. They need to scan your Cartwheel bar code before you pay, so don’t swipe your card before all of your discounts are applied to your purchase. The text coupons are a nice compliment to the Cartwheel app. Start by texting COUPON to Target (827438). You’ll receive monthly discounts on pre-selected products, expiration date reminders, and additional special discounts on certain products or departments. You can use individual text coupon offers only once at checkout. Click on the link in the text message, and the offers will open up in a page in your smartphone’s Internet browser. There’s a barcode at the top that the cashier can scan at checkout. Occasionally, Target will post signs in the store for special offers and a keyword that you can text to the same phone number to get the offer. These offers are often for a limited time, so keep your eyes open for the signs! Target’s in-store credit card always takes 5% off your total, but did you know you could get a Target debit card? The debit card connects with your bank account, and functions the same way, but you get 5% off for all of your purchases. And, if you get your prescriptions filled in Target’s pharmacy, join their pharmacy rewards program. You’ll get a 5% coupon for your entire purchase for every 5 prescriptions you fill there. The pharmacy rewards coupon can be used multiple times in one day. And I mention this because I have used it multiple times in one day. Don’t judge me. The best part of all of these tools is that they can be used together. I recently got an iPad for 20% off by combining a 10% Cartwheel discount with the 5% debit card discount and the 5% pharmacy rewards coupon. If you want to be in the know about what new deals are being added to Cartwheel, there are a few search tricks you can use to get the latest updates via social media. 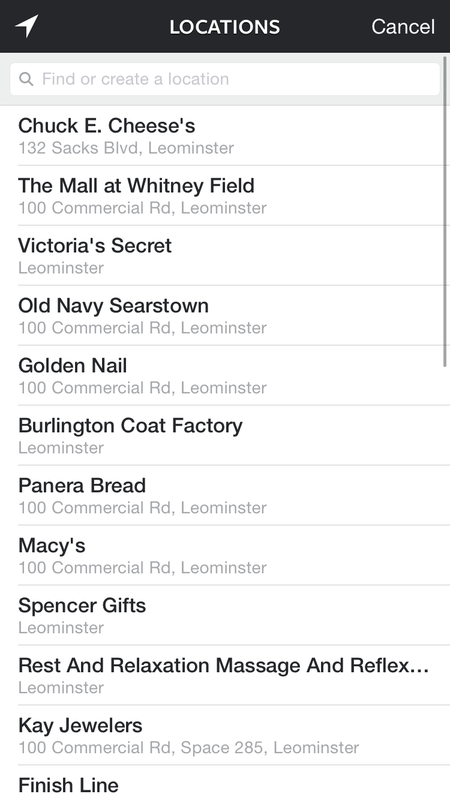 Try searching #Cartwheel on Facebook, and you’ll see all public posts with that hashtag. There are tons of websites and blogs that post daily about what they’re finding on Cartwheel. Or you can set up a Twitter search for #Cartwheel. You can make it a saved search for your Twitter profile by clicking the More Options tab, and then click Save this search on the dropdown menu. If you aren’t a Target believer, maybe these smartphone tools and other offers have convinced you to join the Cult of Target. Got other ways to save money there? I would love to hear about them! Let me know in the comments. OK, technically Layout is a separate app from Instagram, but it was created by the folks at Instagram. Layout allows you to quickly combine multiple photos from your phone into a collage. 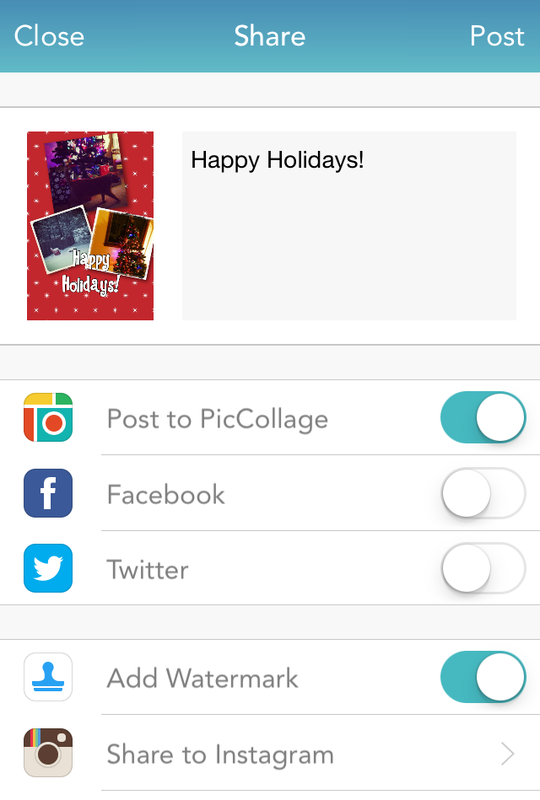 Choose the images you want, and Layout will automatically give you photo collage suggestions. Scroll through the options and click on any of the images to switch them, rotate, or choose a mirror image option. 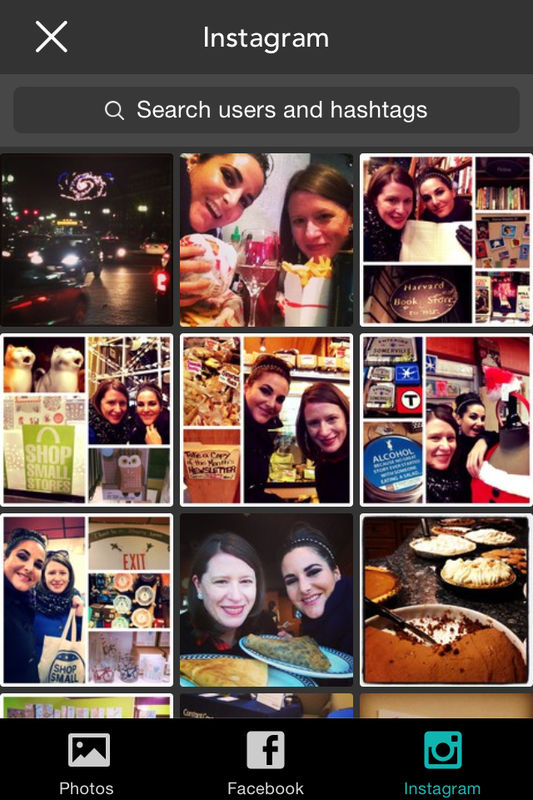 When you have the collage you want, upload it to Instagram, Facebook or a few other options. If you’re sharing it through Instagram, follow the regular steps to edit and post to your feed. 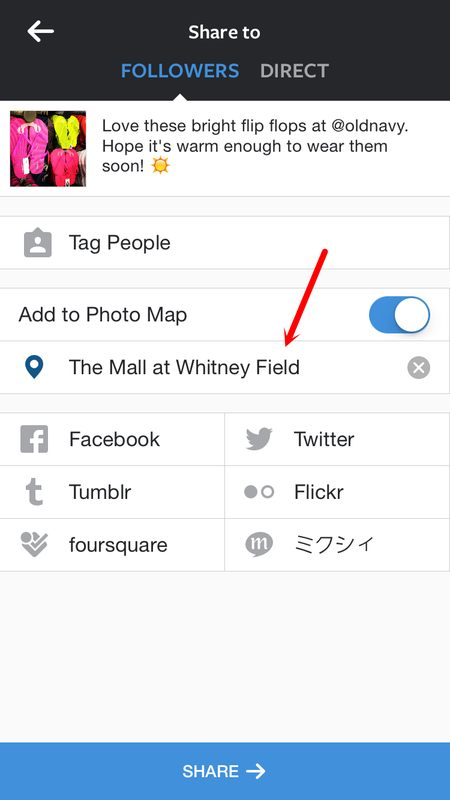 Did you know that you can tag your Instagram images with a location? Instagram uses geotargeting – if your phone’s privacy settings are turned on – to offer location suggestions. When you’re filling out your photo caption on the “Share to” screen, turn the Add to Photo Map function on, and then click on Name This Location. Choose a location or create a new one. The location will appear on the “Share to” screen. When you share your photo, it will be tagged with the location. Want to see more photos that were taken at that location? Click on the tag. 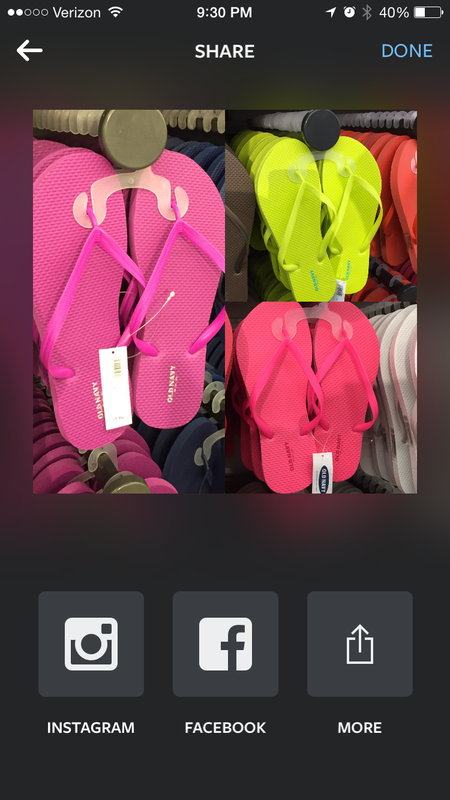 You’ll be able to scroll through images that share the same location tag. This is a great way to find out more about a location, and to show you’re a loyal fan! Instagram recently added some options that will help you organize your filters so that you’re using the ones you like the best. 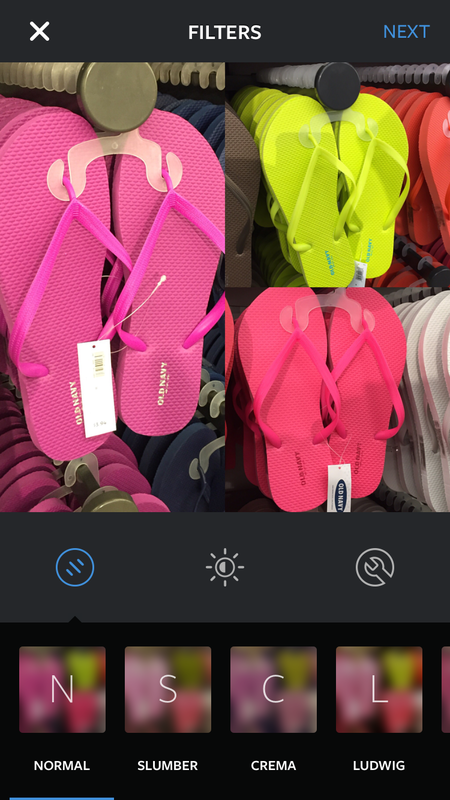 To organize your filters, click and hold to highlight a filter. You can drag it anywhere on the row so that your favorites appear at the front of the list. 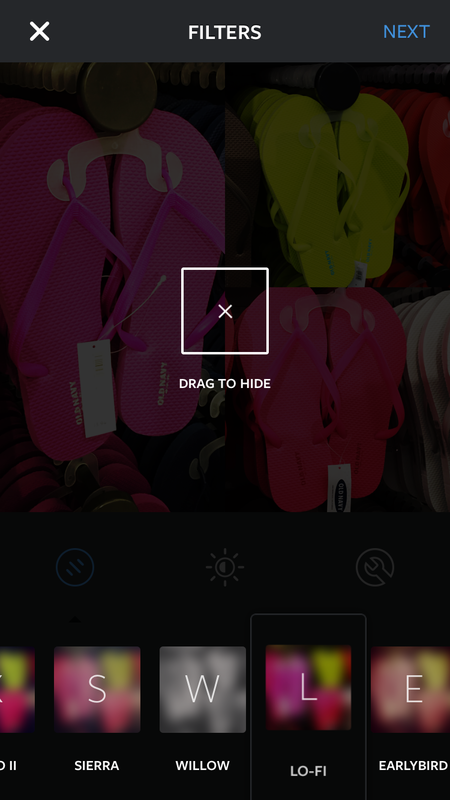 If there are filters you hate and never use, drop them to the middle of the screen to hide them. 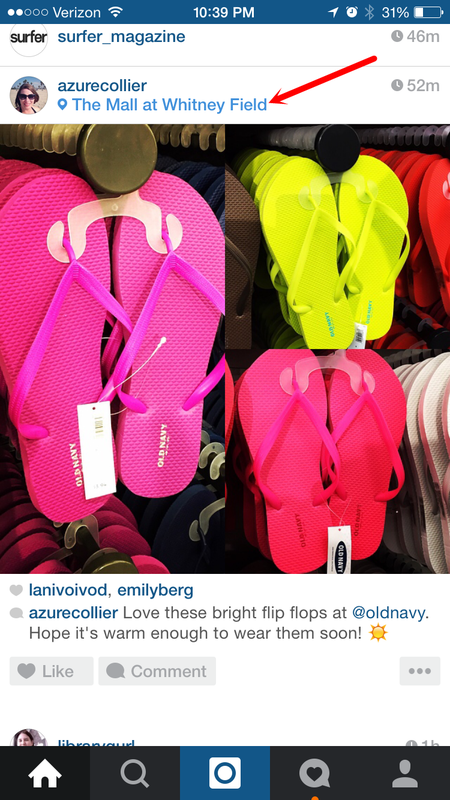 Have you used any of these Instagram features? Which one do you like best? The holidays are a great time to experiment with your visual content, but if you’re not a designer or have paid the big bucks for software like Photoshop, how do you create seasonal visuals that look designer-made? This online photo editing site offers lots of holiday goodies in its themes section. Start by selecting the edit mode, then upload your photo. You can also choose design to create an image with a colorful background and text (like a quote, fact, stat or tip), and add some holiday flair. Then select themes by clicking on the snowflake icon on the bottom of the left column. The Winterland theme allows you to add snow, frost, snowflakes, snowmen, and a few additional landscape effects to your images. Click over to SantaLand to insert Santa caps, elf hats, and reindeer antlers to people and pets in your photos. Or add Santa, his buddies, trees, presents, stockings and candy canes. Some of the effects and overlays are free. However, there are some that you can only access with a PicMonkey Royale account, which costs $33 a year. If PicMonkey is a tool you plan to use on a regular basis, it’s definitely worth the money! 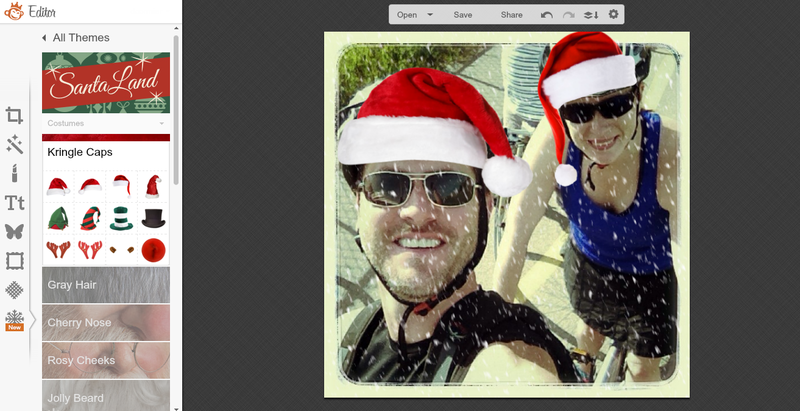 Pro tip: Want to use a snowman, Santa or candy cane in another photo editing tool? Create a new design in PicMonkey and select transparent canvas when choosing your canvas color. Then save the image to your desktop and import it into whatever editing program you want to use. 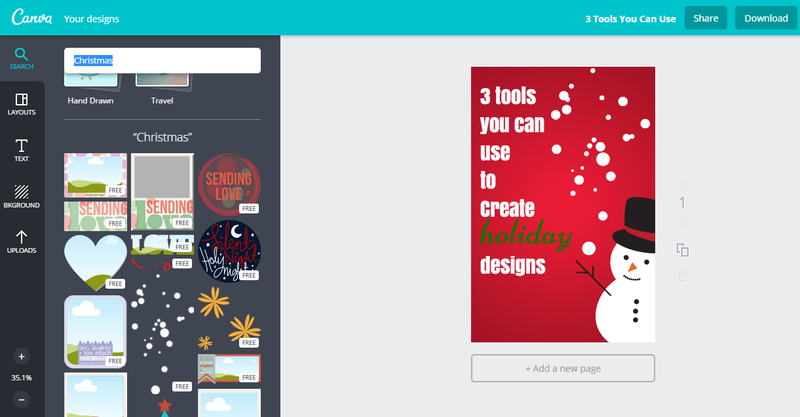 Image creation/editing site Canva has some free overlays you can use in your holiday designs. Start a new project by selecting one of their many templates for Instagram, Pinterest, Facebook cover photos and more, and then do a search for Christmas to find some free images. Canva offers tons of photos of Christmas lights, Christmas trees, ornaments and more, but most of these images can be purchased and use for a small fee of $1 each. 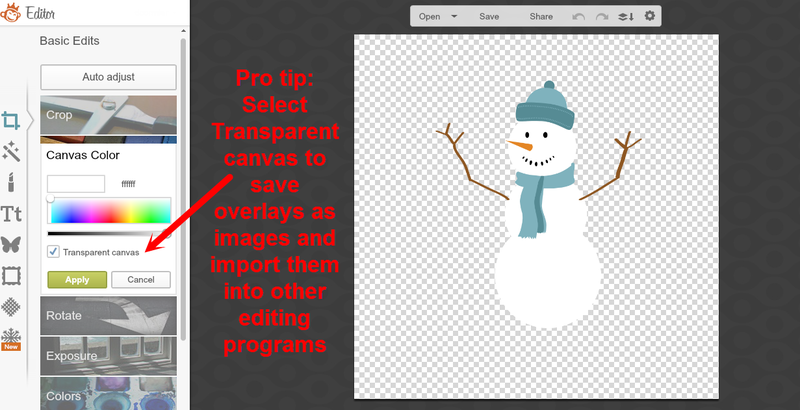 I created the image at the top of this blog post in Canva, and used free overlays of the snowman and snow. 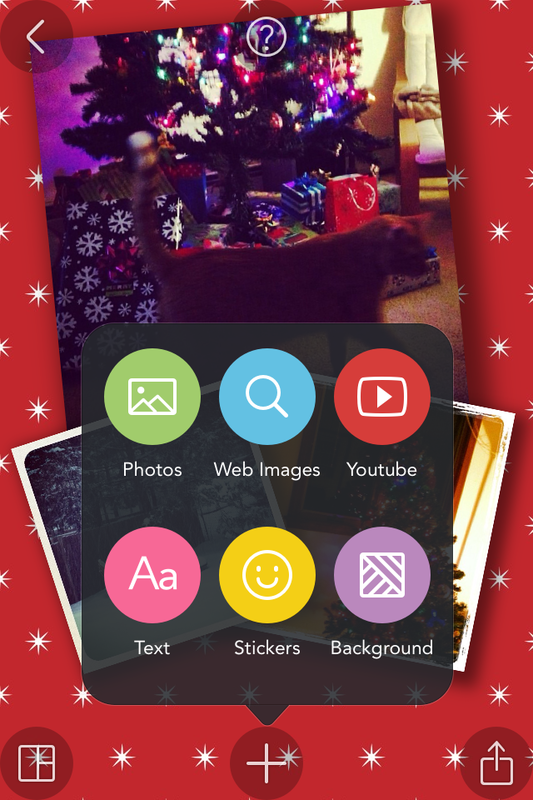 The free PicCollage app can help you create holiday images on the go by using your smartphone. 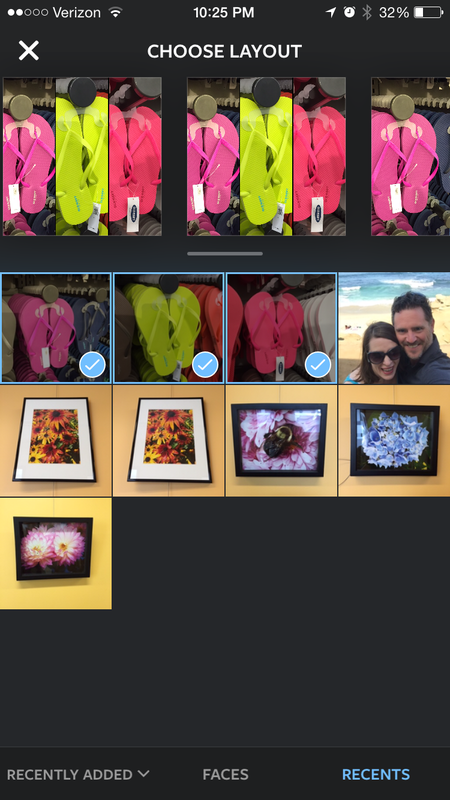 Access photos from your phone, or connect to your Instagram and use images from your account. 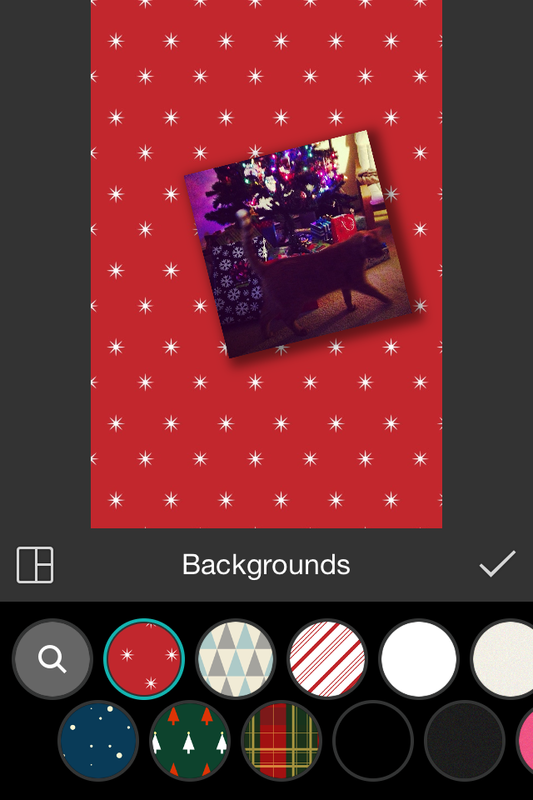 Then choose templates and add holiday-themed backgrounds. 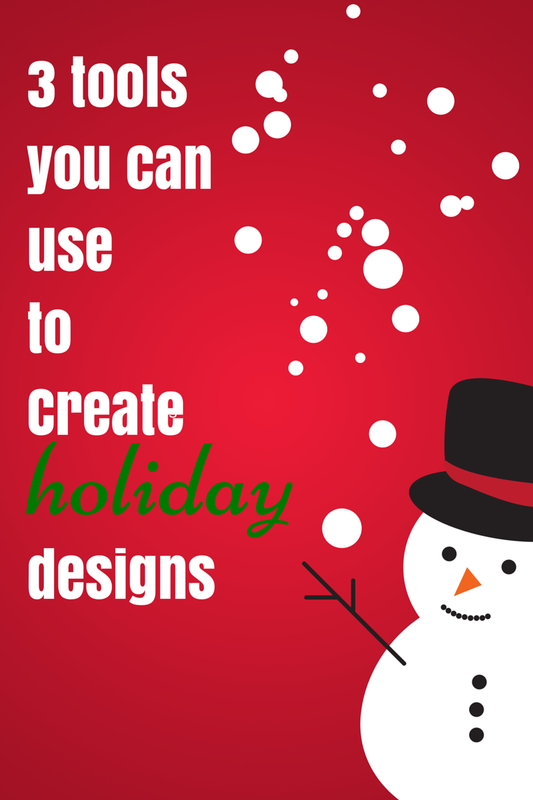 You can also add text, choose a font, and insert holiday stickers. Some stickers are free, and some sticker sets cost $1.99. When you’re done, save the photo to your phone; post to Facebook, Twitter, or Instagram; or send it via email. How do you add some holiday flair to your content? These are just 3 tools you can use to dress up your visual content for the holiday season. What are your favorites? Did I miss any? Let me know in the comments and I’ll write about them in a future post! Anyone who uses social media marketing to promote themselves or their business wants people to see and interact with all the content they’re sharing. Sometimes that just doesn’t happen. You have an off day, a post that gets less engagement than you had hoped, or nothing but crickets. But there are a few things you can do with your social posts to increase the odds of engagement. 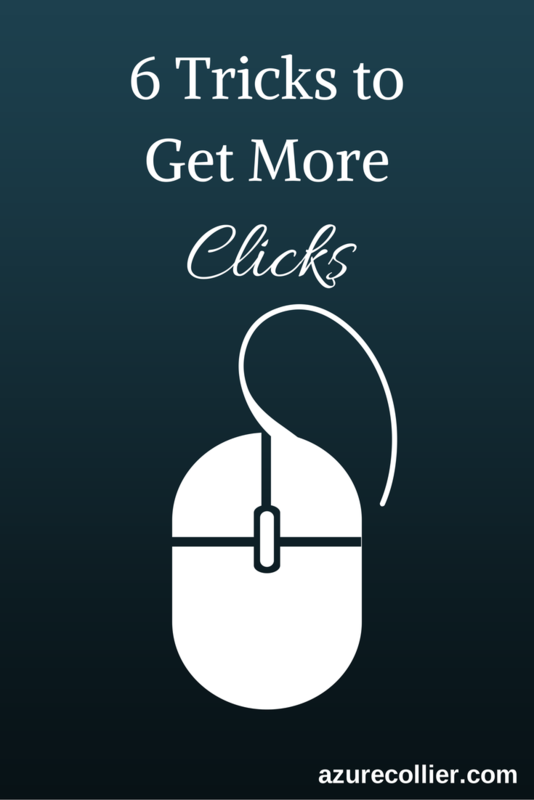 Here are 6 tricks to get you more clicks. Hashtags help to highlight the topics you’re talking about in a social post and make your content more searchable. And they’re used on all the social networks. When you use a hashtag, the network will turn it into a link, and when you click on it, you’ll see all the posts on that network that also use that hashtag. When people click on those hashtags, your post will be shown as part of that conversation. Take a look at Facebook, Twitter, LinkedIn, Pinterest, Google+ and Instagram and see what topics are trending. Use relevant hashtags for those topics in your post, and your content will be more likely to be seen by a larger audience. When Spike TV’s Frankenfood truck stopped by my office to give out free samples and publicize the show, I took an Instagram photo, and shared it on Twitter, using their #frankenfood hashtag in both places. Frankenfood saw the tweet and retweeted it, resulting in a 52 engagement actions, including 14 link clicks, 11 clicks on the tweet to expand it, 9 clicks on the photo, and 7 favorites. Everyone is interested in the latest trends – we want to know what everyone is talking about, what’s popular. Why can’t it be your content? If you’ve been using a link shortener like bit.ly or Hootsuite’s ow.ly when you’re sharing links to your content or curated content, check your stats at the end of the week. Which of your posts got the most engagement? Retweet yourself or repost on Facebook using the same link and tell your followers it was your best content of the week by adding the hashtag #mostpopular. Anyone who read it or missed it will see that it was trending and they’ll be curious – why was this so popular? A few weeks ago, I tweeted a link to a blog post about the Seinfeld emoji app, and also shared the link to the blog post on Facebook. It got the most clicks out of my tweets that week, so I retweeted it that Friday as my #mostpopular tweet, and got a few more clicks. People love trivia and learning little nuggets of information that help them connect the dots about what’s happening in the world around them. Think about the content you personally or your friends share on Facebook. I bet there’s at least one thing that shows up in your news feed that makes you think “Hey! I didn’t know that. Pretty cool.” Do the same thing for your followers. Share something that makes you say that, but make sure it’s relevant to your business and your social voice, and link to the news story or blog post that talks about the stat, fact or tip. Make it stand out visually – create some graphics with free tools like PicMonkey or Canva to Illustrate your stat, fact or tip. Share the image in your social post and link back to the blog post or article. Here’s a tweet I posted that includes a link to tips on finding the best time to post on social media. People are always looking for tips like this! By now, it’s no secret that photos, video and graphics get more engagement than a text post. It’s why all of the top networks – Facebook, Twitter, LinkedIn, Pinterest, Google+, and Instagram have either improved the quality of the display of visual posts in their newsfeed, or added it or are all visual. If you haven’t started sharing multimedia, what are you waiting for? Post photos to visualize your blog posts. Post photos on their own. Show off what you do, what you sell, or what happens behind the scenes (to show off your personality). You don’t need a professional camera for this. Use that gadget you keep in your pocket all day and on your bedside table at night – your smartphone. Smartphone cameras have improved a lot. That’s one of the reasons your iPhone is so expensive. It’s a fancy camera! Just make sure your photos are sized appropriately for the social network you’re posting to. Not sure what size you need? Check out this handy social media size guide for Facebook, Twitter, LinkedIn, Google+, Pinterest and Instagram. This is a simple photo collage I shared on Twitter when our office started offering manicures at work from Manicube. You can see it got some nice engagement when you view the stats via Twitter’s analytics tools – 13 clicks to view the photo, 10 clicks on the link (which linked to the original Instagram photo), a few favorites, retweets and clicks on my profile. Pretty sweet! Please promise me that you won’t use your iPad or whatever tablet you own to take pictures. That’s embarrassing. It looks like you’re holding up a book and smashing your face in it. Just don’t. Cameras are tiny. Use your smartphone. Your phone also records video, so share that too. Record a greeting to your fans – tell them what’s new. Or try a how to video that includes instructions on how to use one of your products. Just make sure the video is short. Attention spans have changed – more than half of viewers will stop watching a video within the first 90 seconds. If you want people to see your posts, sometimes you have to do something that personally asks them “Hey would you please click on this?”.Try tagging people in your posts. When you tag someone, they get a notification and they’ll be more likely to click on your post and share with their networks, which gets you more clicks. But don’t be obnoxious about it, like this person. It’s like they’re on a public sidewalk shoving a flyer in my face: “HEY I DON’T KNOW YOU, BUT READ THIS THING!” First of all, I don’t know who you are and if you’re credible. Secondly, you clearly aren’t a social media expert because you didn’t shrink your link in your Twitter post and you maxed out your 140 characters with a long link. So no, I might not like your post. Also, I might just block you and report you for spam. How do you do it the right way? Relevance. Tag them if you or someone else mentions them in the thing you’re linking to (like a blog post). Tag them if you have a relationship with a person and you know them well enough that they would be interested in the thing you’re linking to. I tag my alma mater, Purdue University, when I see a blog post or news article that mentions them or their community (which is also my hometown). Sometimes they are very generous and retweet me, which gives my tweet more exposure to their 44,000 followers. Here’s a recent tweet I shared about a Forbes article that listed my hometown as one of the top places for small businesses and careers. It’s relevant to Purdue so they retweeted it. 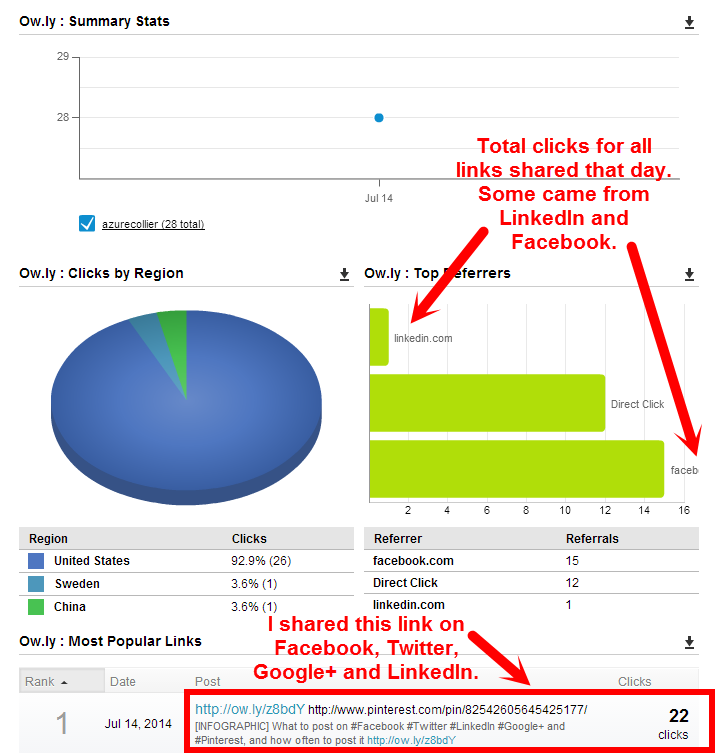 According to Twitter’s analytics, the link got 66 clicks! 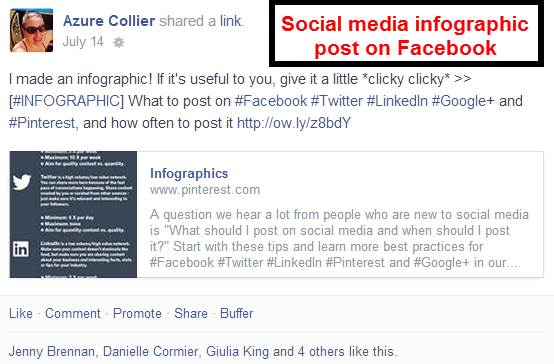 Another great way to get clicks is to post the same content on multiple social networks so that more people will see it. You don’t have to be on every network – just the ones that are relevant to you and your audience. It’s OK to post on multiple places because your followers aren’t exactly the same people following you every place. If you were to print out a list of your Facebook fans, Twitter followers, Instagram followers, etc., you might have some overlap, but there could be some people who follow you on one or a few places, but not all. 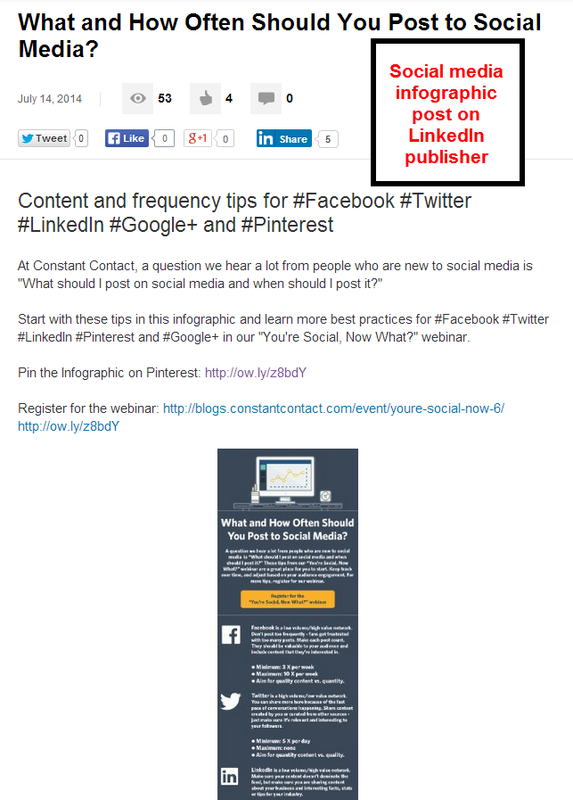 Don’t isolate your content to one network – people might not catch it there if they follow you on a different network. Or if they are following you on multiple places, well, clearly they like you. They won’t mind seeing the same thing a few times – in fact, they might scroll by and make a mental note to read your content later when they see it on Facebook, and make the move to click when they pass by it on Twitter. Just make sure that you are not auto-posting and blasting out the same exact thing to multiple places. Keep in mind the nuances and etiquette of posting on each channel. If you’re auto-posting your Facebook posts to Twitter, those Facebook posts won’t work as tweets. If you exceed the 140 character limit in your Facebook post, it will get cut off on Twitter, which means a long link you post on Facebook might end prematurely in your tweet. Also, if you’re not changing up the content a little bit for each channel, you’re not really giving people a reason to follow you in multiple places. According to HootSuite, it got 22 clicks in the first 24 hours. On the day I posted it, it was the only one of the links from my tweets that I shared on multiple networks. You can see referrals came in from LinkedIn and Facebook. 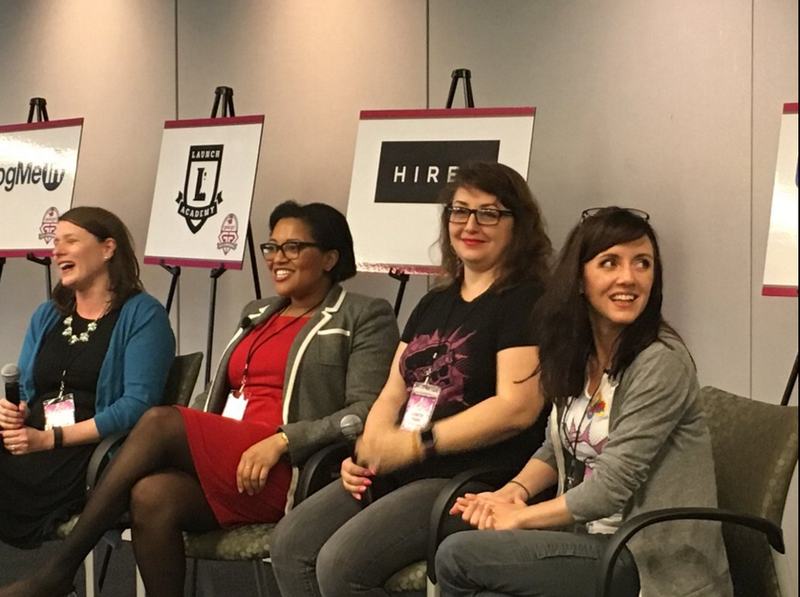 These are just 6 examples of how to get engagement with your content. How do you do it? Leave your tips in the comments or link to tips that you’ve seen on other blogs. I’d love to learn a few new tips!